I immediately thought of the words that I thought should be on that list. The words they chose, however, weren’t anywhere near to what I was thinking: Detox, Cleanse, Skinny, Never and Perfect. While I might agree with “Never” and “Perfect,” they didn’t come up on my list. Whenever you use the word “should” you are shaming yourself. You are making yourself wrong. I should get my eating under control. I should kick my exercise up a notch. I should stop eating junk food. I should only eat plant based food. I should eat low carb. All of these statements are examples of a binge waiting to happen. Whenever I tell myself any of these things, I try to do them. Whenever I try to control my eating or exercise too strictly, I end up bingeing. The word “should” is a strong indicator that something is amiss in my life and it isn’t the food or exercise. No one can exert willpower over a biochemical drive that goes on every minute of every day of every year. No one chooses obesity. Obesity chooses them. Getting your brain to release dopamine and mono-amine neurotransmitters is the way to curb your desire to overeat, over-exercise, purge or starve, NOT control. 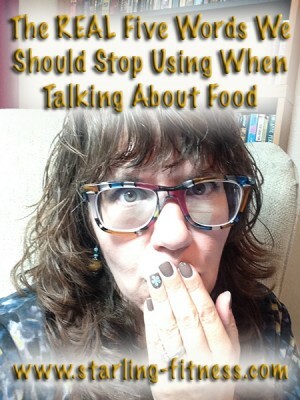 The word “bad” is misused so much when we talk about our eating or exercise. I have been really bad lately. That food is bad for anyone to eat. I’m really bad at exercising hard enough. The sooner you can release the shame surrounding food and exercise, the sooner you will start healing. YOU HAVE A DISEASE! Would call a person couldn’t walk bad if they broke their foot? Then you shouldn’t call yourself bad when you eat poorly. This isn’t about good or bad. This is about your broken brain and getting it to fire up correctly. Stop beating yourself up about food. This isn’t your fault. Science doesn’t even know where the blame lies, but so far, it mostly looks like it’s genetics. Would you call a person bad because they got cancer? Then you shouldn’t call yourself bad because you overate. This is another indicator that something is wrong in our lives and it’s not about the food or exercise. I always eat too much at parties, so I can’t go to them. I always binge when I eat sugar, so I can’t eat any at all. I always wimp out in my exercise, so I have to work harder. I always binge at buffets, so I can never go to them. I always eat too many calories when I eat meat, so I can’t ever eat it. The word “always” sets up a black and white mentality. It makes you think that you have no choice but to do it the severe and strict way. You can avoid parties, meat, sugar and buffets only so long before they start to sound like the best thing ever. Once you reach a weak point in your willpower, you will head straight for that buffet line. If you cut the word “always” from your vocabulary, you give yourself a little breathing room. You stop making those things sound like forbidden fruit and make them less mystical. This is the most important word that you need to remove from your eating and exercise vocabulary. I can go it alone. I don’t need other people to help me. I can do this by myself. No one would understand this problem anyway. No one else seems like they have this much trouble with eating healthy. No one else seems to have trouble with exercising too much. There are people out there who are suffering just like you are. If you are going to survive this, you MUST find them. I found them at Overeater’s Anonymous and the help I have received from that program is incalculable to me. You might find them in a therapist’s office, your church, at a nutritionist or even at Weight Watchers. Without the added benefit of other people, you are lost. You have to have someone to call when your brain is low on dopamine. You have to have someone to help you through the hard times.